Sensitive people are often considered dramatic or attention-seekers. While it might ring true with some, I believe that there’s certain prejudice attached with this word. Being sensitive isn’t a bad thing. Period. When someone feels deeply about something and sheds tears, then he/she is being a cry-baby. If something unfortunate has happened but he/she isn’t showing signs of depression or hysteria, then it is insensitive on their part. How can anyone decide what is or isn’t the right way to feel or express? Just like everyone’s fingerprints are different, so are the wirings of their brain and heart. They do what they do because it seems right to them. I’m emotional and overthink or overreact at times, but that is who I am. Unless someone can enter my mind and see what torment I go through for seemingly unimportant issues, I should be spared from any sermon. For people who know me I’m a damaged incorrigible emotional wreak, but a dependable person nevertheless. Those who don’t know me, well, why bother about them? My life and my challenges are my concern and I’m capable of handling them well. Life is never simple, is it? Matters that affect both our mind and heart but on different levels are even tougher to handle. Honestly, I think I’ve grown over the stage where what anyone thinks or makes me feel really matters to me. Temporarily it might, but I feel sorry for them for not getting me. Yes, sometimes things are clearer to strangers than it is for our close ones, and it is only natural. A one-off experience and continuous exposure cannot be compared. That’s what. We can feel everything or nothing in one given day. We don’t need to be bracketed or limited. Circumstances play a bigger role than we can imagine. We don’t give them enough credit. Same here im a so damn emotional person and I dnt want to be. It isn’t in our hands, is it? We cannot change the way we are made. Yes, if it gets us hurt then we can try and work towards not letting us ruin our peace. Ya exactly,hoo its not in our hands,some of us r made that way ,we just feel so much and we need to work towards it seriously. nothing wrong varsh….never could i control when my eyes start to speak..
Ahha…akhiyon se goli maare Akh. ???????? God/ Nature created enough variety among humans. We are all unique pieces! celebrate your uniqueness! A good read! People often get judgemental about others without knowing what they go through. Exactly. Wish it was easier for people to accept that people can be very different and feel different things about the same thing. I am one sensitive woman…..and I hate myself for being so sensitive. You get emotionally stabbed by people all the time. I am making a lot of effort to come out of that mould……so far only marginal improvement???? I hear you. I only believe now that people who understand our emotions and value them for what they’re worth should only be allowed to enter the depths of our heart. It takes time, but it helps to guard ourselves. People play games with sensitive people and use them very well knowing how mean and wrong it is. It is their own fault…and am sure they cannot sleep peacefully at night due to the conscious or subconscious guilt of it. Kisika bhala karo to bhalai kabhi na kabhi zindagi mein wapas aayegi. Isn’t it Bikram? ???? I don’t know what to say to that. I am waiting for that bhalai to come my way .. I don’t know it is true that they can’t sleep properly..
Bikram…the way we perceive or understand things is different. If something good happens we think it is destiny…isn’t it possible that it is a par of this bhalai coming back? I hope it stops soon. . God knows how many bad things I have done.. in this or previous life.. but I just want it to end now.. ???????????????????????????????? Haha…he will. Shall I ask my Mom to put in a word for you? ???? ???? Sensitive people have empathy which others don’t easily have. Now, that isn’t a bad thing. Is it? 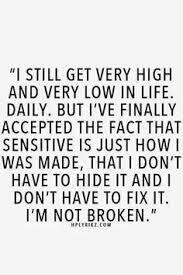 Crying and sensitivity might be related but they aren’t the same. Some people never cry but have a tender heart. A for example. Sensitive makes us human na…or we would be robots. Previous Post When you miss someone..